We’d love your help. Let us know what’s wrong with this preview of Zadig/L'Ingénu by Voltaire. To ask other readers questions about Zadig/L'Ingénu, please sign up. Quick, enjoyable reads, very much in the spirit of Candide (read previously). Very interesting to see the different ways the Voltaire presented his thoughts on good and evil and religiosity. Would have been more enjoyable to read an edition with footnotes to explain historical context beyond those supplied by Voltaire himself. I'd never read Voltaire before this book, but I've found that he's quite a funny author. 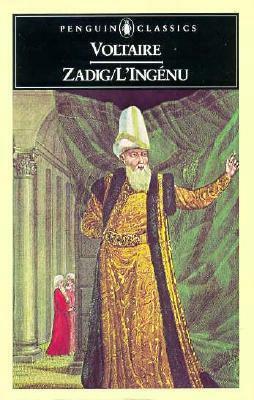 I especially enjoyed Zadig, and his misadventures that led him to becoming King. Although, he does tend to portray women in a negative light, the stories are still entertaining, and have lots of meaning, especially when taken in context of the time frame in which they were written and the politics in Europe. Candide was naive and amazing, Zadig was ingenuous and good looking. Las chocoaventuras de Zadig han provocado que recuerde la estrecha relación de los héroes y el destino. I read this book while travelling to and from grandmother's Michigan cottage via the Chicago South Shore, South Bend RR and its bus connection to Bridgman in Michigan City, Indiana. Having liked Candide quite a lot, I expected much from more Voltaire but was somewhat disappointed by these two less outrageously funny tales. These stories are every bit as good as "Candide," if not superior. Voltaire is probably the funniest pre-1800s author I've read. However, don't let the humor fool you into thinking the stories lack depth. Intellectual stuff! Good to have an insight into this aspect of French enlightenment. An amazing story of a person endowed with good knowledge, wit and honesty who scuffle in every sphere of life by his destiny. much about love and it's varieties, friendship or amity, cicero brought me much peace at the tender age of 15.